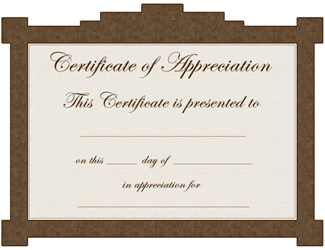 Show your appreciation with a certificate! Click here to download 20 FREE high resolution certificate templates. The world today, especially the job market, is more competitive than ever before and many people around the globe are finding it increasingly difficult to remain not only relevant but also appealing in this environment. As jobs continue to become scarce, emphasis by many employers is laid on the level of qualifications that the candidates applying for the jobs bring to the table. The more the qualifications, the greater the chances of qualifying for a given position. It is because of this reason that many people, especially job seekers, are always participating in various training courses and programs. Upon completion of a particular program, participants are normally awarded a certificate of completion which serves as proof that they were part of that particular training or course. As mentioned above, a certificate of completion is the only real proof that applicants can submit to show that they attended a particular course or training. The certificate itself however, in reality, is more than just a piece of paper. Having a certificate is one thing and while it may boost the chances of succeeding in a job application or similar competition, there are many aspects of the certificate that employers normally consider. First of all, it is important to point out that a certificate of completion is only as good as the institution or agency that issues it. This is because the certificates normally bear the identity of the institution from which it was issued and is only as reputable as the institution that issued it. These were created using the certificate templates that we have available for our visitors to download for free. As an institution or an individual issuing certificates of completion to participants who have successfully completed a given course, it is important to bear in mind all of the factors stated above. The value of the certificate will greatly depend on your reputation with regard to the event that the recipients of the certificate participated in as well as the kind of certificate itself. The first factor takes time to build but the latter is one which you can perfect easily enough. So what should you do to make your certificate of completion marketable and, by extension, attract more participants in future to participate in the course or training? The first thing you need to do to make the certificate attractive lies in its design. Try to make the certificate as beautiful aesthetically as possible. 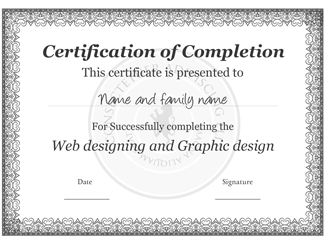 One way through which you can design beautiful certificates is by the use of special and customizable templates. Another factor that should be considered very closely is the forgery of the certificate. You do not want to issue a certificate that can easily be forged by people who have not completed the training indicated on the certificate. The best way to guard against forgery is by creating certificates that that are not easy to copy. To do this, should use special templates in designing the certificates. 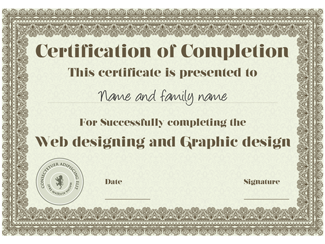 Try to customize the design of the certificate as much as possible using a customizable template. You should also consider printing the certificate of completion on special type of paper that are not very easy to come by.